A group of 23 lawmakers have submitted a bill in the National Assembly calling for the military service exemption for biracial Koreans to be stopped. Rep. Yoo Seong-min of the governing Grand National Party said Wednesday he strongly believes the current law discriminates against both Korean nationals and biracial individuals. 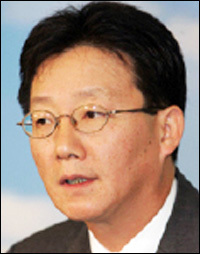 "The Constitution clearly states that every Korean citizen has the right, as well as the obligation to serve in the military without any discrimination," Yoo said. "It is wrong to exempt people whose parents are either blacks or whites, while making it compulsory for those with a Korean background to serve in the military." The Military Service Law revised in 2005 stipulates that those who look distinctively biracial are exempted from service. Han Yoon-gyu, a public relations official at the Military Manpower Administration (MMA), said the military excludes Koreans with a non-Korean parent from mandatory duty over fears they could encounter culture shock and face difficulties in adjusting to military life. He said the number of exempted biracial people is a handful and that the exemption would hardly aggravate a manpower shortage. However, Yoo refuted this, saying the matter may become a serious social issue if left unchecked. He said the military will suffer from a shortage of manpower, unless appropriate measures are taken. "The number of people who dodge military service may rise and aggravate the shortage of soldiers, given that Korea is becoming an increasingly multicultural country and international marriages are becoming more popular," Yoo said. "We have to face the fact that new recruits will sharply decrease due to the shortening of mandatory military service from 24 months to 18 months and the low birthrate of 1.2 per couple." A 2009 survey found that more than 80 percent of Koreans believe biracial Koreans should also be subject to compulsory military service. The MMA conducted the survey between March and May on 1,000 randomly selected individuals and 300 males who were recently included on the conscription list. Asked if multicultural Koreans should fulfill active military duty, 84 percent of the individuals answered in the affirmative. Similarly, 83.3 percent of those waiting for the draft opposed the exemption.